Our double rooms are updated and refreshed rooms offering you an extra touch of comfort. With a modern contemporary style of decoration, and completely renovated bathrooms we have included improvements which will make your stay at the Rio Park even more enjoyable. LED lighting, modern furniture and even more comfortable beds are just a few of the improvements. A flat screen TV with a selection of national and international channels is in the bedroom along with a telephone and desk area. All rooms have a balcony with views across the Benidorm skyline. Our Double Rooms with Club Service are updated and refreshed rooms offering you an extra touch of comfort. Double Rooms with Club Service have included in the price a fridge (mini bar) with welcome drinks, tea / coffee making facilities, bottle of wine, pool towel (per person with 20€ refundable deposit), Club amenities (daily replenishment of amenities), safety deposit box, bathrobe and slippers. The new Family rooms provide extra comfort and space for our guests. We have combined a twin room with a single room providing two separate areas. The main bedroom is decorated in a modern style with your comfort in mind. The extra sleeping area is also a quiet separate relaxing space if there are just two of you travelling, creating a reading area or simply somewhere extra to sit and enjoy a cup of tea. The same area can also be used as a bedroom with bunkbeds. This modern room has a full bathroom with all facilities. All rooms have a balcony with views across the Benidorm skyline. Our Family rooms offer you more space if you are a couple, and comfortable and practical living if you are a family. All Family rooms also have included in the price a mini fridge with welcome drinks, tea / coffee making facilities, bottle of wine, pool towel (per person with 20€ refundable deposit), Club amenities (daily replenishment of amenities), safety deposit box, bathrobe and slippers. The new Family rooms provide extra comfort and space for our guests. We have combined a twin room with a single room , providing two separate areas with a sliding door to separate them. The main bedroom is decorated in a modern style with your comfort in mind. The extra sleeping area is also a quiet separate relaxing space if there are just two of you travelling, creating a reading area or simply somewhere extra to sit and enjoy a cup of tea. The same area can also be used as a bedroom with bunkbeds. 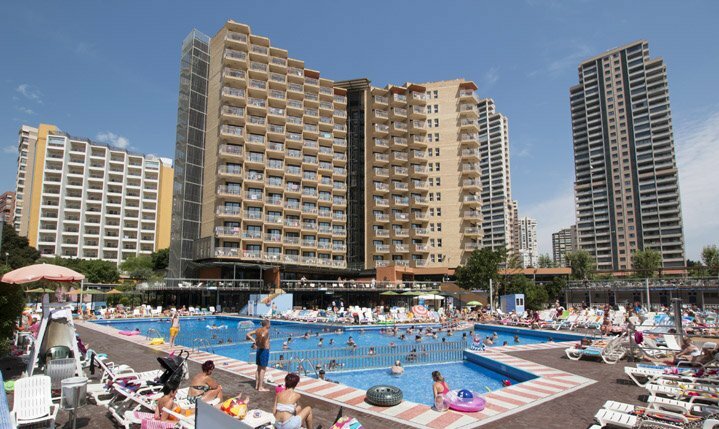 The Hotel Rio Park is located in the centre of the popular holiday resort of Benidorm, just minutes from the sandy beach and main promenade. Theres always lots going on in this busy resort which offers fun in the sun and activities for all ages. The hotel has fully equipped double rooms, superior rooms, club junior suites and single rooms. One of this hotel’s main assets is the personal and friendly staff and service that are popular amongst our guests who return year after year. You will be guaranteed an action-packed holiday that you will never forget. The clean, golden sandy beaches of Benidorm, the warm climate, the skyline and the wide avenues or narrow streets in the old town, all create a fantastic destination for your action-packed or relaxing vacation, whether you are looking for an active nightlife or relaxing holiday on the beach. In order to complete our ongoing refurbishment project for the MedPlaya Hotel Rio Park ahead of the original schedule we have taken the decision to close the hotel from 9th January to 3rd June 2019. This closure will enable us to offer our new improved rooms throughout the Hotel and a new improved swimming pool and terrace area as from 4th June 2019. We hope that you will enjoy your stay at one of our other MedPlaya Hotels during this period and look forward to welcoming you back to the Rio Park once this work has been completed. The Reception will have a more modern look & feel as we will panel the columns, update the actual reception area, refurbish the reception bathrooms and in general update the whole area in a more contemporary style. The main bar and Pub will remain as they are as will the hotel shop; there will be new furniture in the Lobby area. The pool bar will be new for 2019 and will be located on the far side of the pool terrace where there are currently 8 pool terrace level rooms. The whole swimming pool area is being given a new look, along with a Splash area for children. The restaurant is also being modernised with an update of our buffet stations and a new Show Cooking area. The restaurant columns will be panelled and there will be new LED lighting in the restaurant and new flooring. New for 2019 there will also be an outside part of the buffet so an Al Fresco dining area will be available for the summer months. All rooms in the hotel will be refurbished while the hotel is closed. Additionally we are adding 13 Adapted rooms for less mobile customers or families. Please click here: PDF RIO PARK 2019 to see computer images of how the Rio Park will look when we open in June 2019. Click here to see the Rio Park Hall of Fame. • Opening hours: 9:00a.m. - 7:00p.m.